If you have trouble pronouncing words in English, you’re not alone! I’m a native English speaker and an accent coach and there are still words that are challenging for me to pronounce. Today I’m going to share 10 words that I find difficult to pronounce in English even as a native English speaker. A few of these words are commonly mispronounced by native English speakers. Others are words that I personally find challenging, and the rest may be pronounced differently based on regional dialects. By watching this video, I hope you feel more confident knowing that even native English speakers make mistakes. No matter how well-spoken they are, it is still possible for them to make mistakes when pronouncing words in English. Remember, we all make mistakes! All we can do is try to fix our mistakes and keep moving forward. As we get started, I want to tell you about my inspiration for this video. I recently had brunch with a group of friends and we were discussing Earl Grey tea. When trying to describe the unique citrus flavor that gives Earl Grey its distinctive flavor, I mentioned that the tea had bergamot in it, which I pronounced ber-zha-mot. Of course, when I returned home, I looked up the pronunciation – I quickly realized that I’ve been pronouncing this word wrong for years. Even though Earl Grey is one of my favorite types of tea, I’ve been pronouncing “bergamot” incorrectly. Why hadn’t I learned how to say this word right? Well, I can’t remember having even heard this word discussed before. Although I was familiar with the term from drinking so much Earl Grey over the years, I had never heard it said out loud! I made a decision on how the word should sound and repeated it again and again in my head with the incorrect pronunciation. At times, when we read a word but don’t have a chance to say it out loud, we may rehearse the word with the wrong pronunciation over and over again until it becomes a bad, ingrained habit. As a non-native English speaker, you may relate to this! After all, this is how you’ve created accent habits that you need to unlearn in order to reduce your accent. When I learned this word as a young child, I read or rehearsed this word in my own head as “sward” with a “w.” Even though I know the “w” is silent, I still say “sword” to myself. When I say “sword” out loud, I often mispronounce this word because I’ve been saying it to myself over and over again using the incorrect pronunciation. Trust me, I completely understand where your own bad pronunciation habits come from! Now let’s talk about another word that I only recently realized I was mispronouncing: kilometer (/ˈkɪl·əˌmit̬·ər/). I’ve been saying kilometer as /kɪˈlɑmətər/ for years and years. After all, we use miles here in the United States, and the only time I heard a native English speaker use the word “kilometer” was in my high school chemistry class! Since I recorded the video, I remembered that my science teachers taught me that the correct pronunciation of “kilometer” is /kɪˈlɑmətər/. In the end, there is a lot of debate about the correct way to pronounce this word, and of course the pronunciation is different in British English! Another word that I find challenging to pronounce is the word jewelry. I say jewelry as /ˈdʒul·ri/, which is a secondary pronunciation of the word with only two syllables. When I researched hard-to-say words, I realized that it’s usually: /ˈdʒu·əl·ri/. As you hear in the video, this pronunciation feels really unnatural to me; I can’t even really get it right! I have been pronouncing the word correctly according to my regional dialect (I’m from the Northeast of the United States). I thought there was a difference between the British pronunciation and the American pronunciation, but it turns out that many people pronounce that schwa sound in the middle of the word! A similar example is the word miniature. I have been saying miniature as /ˈmɪn·i·ˌtʃər/ with three syllables. However, when I did a little investigation, I realized the word is actually pronounced with four syllables: /ˈmɪn·i·əˌtʃər/. Again, I thought it was because the British pronunciation included the bonus schwa sound, and that Americans just said miniature. However, my pronunciation of the word is simply a regional one! Now let’s move on to two common words that often create debate on the correct pronunciation. First, let’s start with the word niche. Because I’m highly aware that there are two accepted pronunciations of this word, I’m not really sure which one to use! We use the word “niche” when talking about focusing on a certain niche in business. You’ll hear the word pronounced differently depending on the region of the country, the person’s background, and potentially their accent. Niche can be pronounced /niːʃ/ (like the French), or/nɪtʃ/. Americans usually say /nɪtʃ/ and the British say /niːʃ/, but I personally say/niːʃ/ and then I get confused! I keep varying between the two because I feel like I’m not choosing the right one for the person who’s listening to me! What you need to understand is that both pronunciations are accepted; most importantly, the person who’s listening to you will understand either one. A similar word that has always confused me is the word coupon. As it turns out, the correct pronunciation is probably /ˈku·pɑn/ because it comes from French (even though we don’t pronounce exactly the way it would be in French). As a kid, I grew up saying /ˈkju-·pɑn/ (with a “y” sound at the beginning), so that’s how I still pronounce it today! If you search the internet, you’ll find that there is actually a huge debate among native English speakers about the correct pronunciation of this word. Most people have learned the pronunciation of coupon based on their regional accent, and they’ve loyally stuck to it! To be honest, I sometimes switch between the two, but I’m more loyal to coupon as /ˈkju-·pɑn/ even though I know that’s not the most common pronunciation in my area. Next, we’re going to talk about a word that always ends up on a list of the top 10 most difficult to pronounce words in English. That word is rural. If you can’t say the word “rural,” don’t worry, you’re not alone! Many native English speakers, just like myself, have trouble saying that word. Why is that? In American English we have that very American “r” and rural has two of them back to back: /ˈrʊr·əl/. For those of us who have a regional accent where we pronounce words with our mouths a little more closed (like me! ), it’s hard to say a word like rural. I really have to think about it. If I’m pronouncing the word in the middle of a sentence, it’s a little easier to say. When I say “I’m from a rural area,”I can hurry through that word, but if I try to pronounce the word in isolation, it sounds weird. This is why I often tell you to make sure you pronounce words as part of a phrase. That makes difficult words easy to say, you may be understood by context so you don’t have to worry about having the exact precise pronunciation of the word. Another word that’s really hard for me to say is the word mirror: /ˈmɪr·ər/. I have to really think about it. When I was in college, I realized I was mispronouncing this word. My roommate told me that she had noticed I said “mirror” wrong, but she didn’t want to tell me until I noticed it myself and said something about it! To say “mirror,” I have to really remember to move my mouth more actively. Like the word rural, it’s hard when there’s so many “r”s together because we tend to move through this word quickly. If you have trouble saying that word, you should feel better – I join you in the difficulty with the word “mirror”! The last word I’m going to share today I only pronounce correctly one time on the video. Before I hit record, I practiced it a few times to see if I could remember how to say it. Why do I find this word really hard to say? For starters, it has a lot of different vowels in it. It also has stress that I’m not quite comfortable with. Even though I do often use this word in conversation, I stumble through it every time. \This is one of those longer, more technical words we use to talk about people’s rank in an organization. Because I don’t feel confident pronouncing this word, I often try to substitute other words like levels or different status. I share this because I want you to understand that even I have trouble with words. Yes, I might feel a little embarrassed recording a video about how hard that word is for me, but I want you to understand that it’s normal to have trouble pronouncing words. After watching this video, I hope you feel more confident knowing that even trained professionals like me have trouble pronouncing words, too! Like I always say, native English speakers make mistakes when speaking, so you don’t have to worry too much about your own errors. The goal is to recover from the mistake and keep going. If I make a mistake with pronunciation during a conversation, I usually acknowledge the mistake, say “I always have trouble with this word,” and then keep going with the conversation. At times, this mistake can lead to a funny conversation about words that are difficult to pronounce. As a non-native speaker, you may feel like making a pronunciation mistake is a reflection on your ability to speak English. On the other hand, native English speakers know it’s their native language and they just keep going. For this reason, I just want you to understand it’s usually good to laugh about making the mistake and then just keep going with the conversation. So now that you know the 10 words that *I* find difficult to pronounce in English, what are words that you often feel like you’re mispronouncing? Leave a comment and let me know! 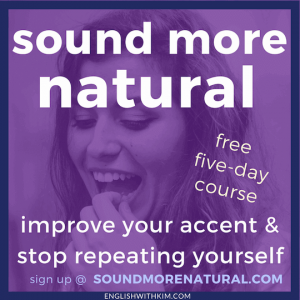 For more guidance on how to reduce your accent and improve your speech, I encourage you to join my free email course. Over five days, you’ll get started speaking English more clearly and more like a native speaker. Hi Kim. What a great list. Isn’t it funny when you realise you’ve been pronouncing something wrong for years!? At least with “bergamot” you can usually just say “Earl Grey” instead. A word that causes a lot of debate in the UK is “scone”. Some people think the vowel is a diphthong /əʊ/ but I pronounce it with a short vowel /ɒ/. I cannot stand the other pronunciation! Same with “niche” – for me it’s a long vowel and the other pronunciation annoys me! As for syllable variations, in fast speech, I think most of these distinctions disappear because we’ll probably reduce the number of syllables and some of the differences won’t be as marked.